Emerging from the hype of Michelin-starred eats and Mod-Sin cuisine comes a refreshing take on local dining: “Kampong French”, a three-week restaurant takeover at Open Farm Community by the award-winning nomadic culinary collective Paris Popup, is a guerilla-style dining experience that showcases exceptional dishes made with the season’s finest local produce whipped up with a touch of contemporary French flair. Over the course of merely 7 days, the popup team — consisting of Harry Cummins, Laura Vidal, and Lina Caschetto – combed Singapore’s fishing ports, heartland wet markets, and the edible garden at Open Farm Community to source for uniquely local ingredients, producing an ensemble of 12 drool-worthy small plates that bring out the best of Singapore’s flavours. 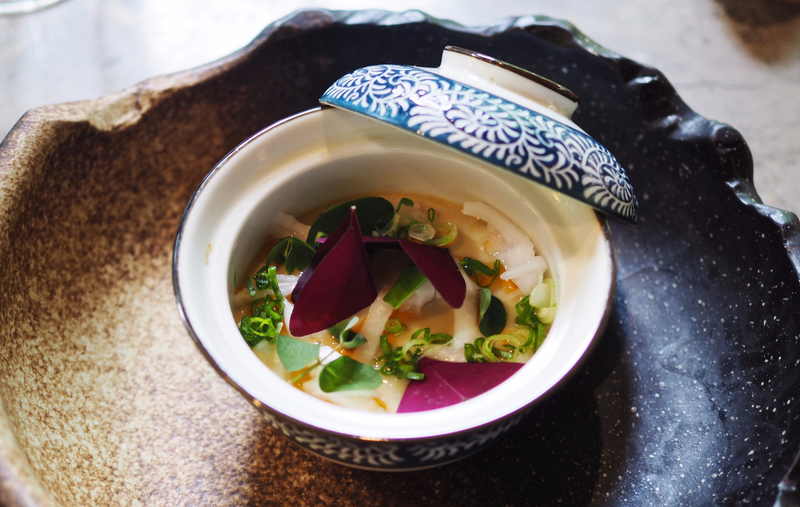 Kicking off the menu is the decadent Shrimp Chawanmushi; fragrant with flavours of the ocean, each pillowy-soft mouthful of the steamed egg comes with shreds of sweet young coconut shreds and garden city sorrel that give it texture and sweetness. Paying tribute to the local roti prata is the flatbread rolls with a savoury potato filling, topped with ‘chai poh’ (preserved vegetable) and spring onion. Truth be told, we can’t get enough of this! Move aside, Caesar Salad – we’re convinced that this medley of Long Beans, Wing Beans, Sesame, Tempeh, Shallots, and Mint and its creamy dressing may just be the next best thing! The Aubergines with XO sauce are also a hit, where perfectly steamed local brinjals are drizzled over with a punchy XO and bone marrow sauce and topped with crushed peanuts. Getting mussels right can be a hit and miss but Chef Harry does it to perfection with the Big Head Green Mussels, Kai Lan, Nuoc Cham, and Fried Shallots. Have the mussels as is, then try it with a side of the smoked mayonnaise dip (your taste buds will thank us). We couldn’t stop tucking into the Mud Crab, Tagliolini, Bisque, and Chives either: a thick and luscious mud crab sauce which is tossed with homemade pasta, resulting in this delightful creation that will have you wiping the plate clean. Haven’t heard of pearl groupers? It’s about high time you’re introduced to this beautiful fish, and a good place to start is the Pearl Grouper & Lala Clams here, topped with a fermented black bean tapenade. For those looking to get their meat game on, you mustn’t miss the barbeque pork echine that’s nicely charred on the outside but tender and juicy all the way through. Trust us – these will have you singing till the very last bite! Your gastronomic journey here isn’t complete without this beautifully-presented Calamansi, Coconut, Goat Yogurt, Pomelo, and Grass Jelly. Combining sweet, creamy, and tangy flavours into this beautifully-presented dessert, we can’t think of a better way to round up a meal. If you haven’t already, drop by “Kampong French” at Open Farm Community from now until 3rd December 2017 to experience the best of local produce in ways you wouldn’t have thought possible! Plus, get the low-down on Chef Harry of Paris Popup here. Find it at 130E Minden Road, Singapore 248819. Book a table at Open Farm Community and earn 2X Chope-Dollars with the code TASTYBLOG.